If you’ve been reading along, you know I’m a fan of technology that just works without extra hassle. And, to that end, I’m becoming a believer in Bluetooth solutions because it just works with your phone. 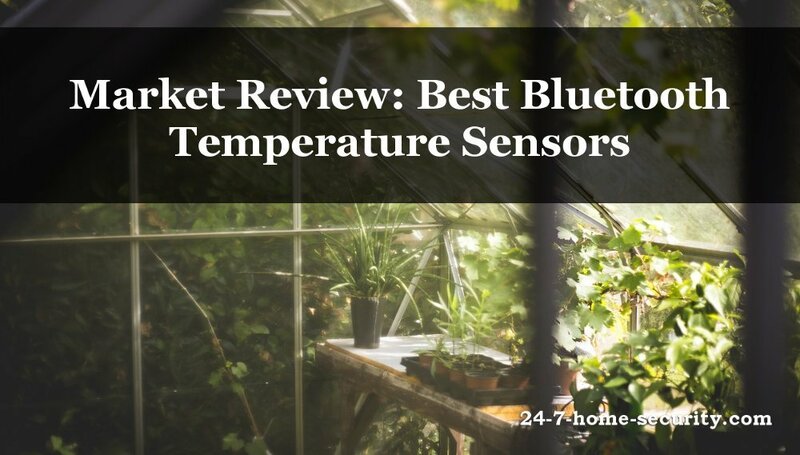 Need to keep an eye on a greenhouse or some pets when it gets cold outside and a wireless temperature sensor is more convenient? Looking for a swank grill temperature probe for a gift? Consider setting up Bluetooth temperature sensors to keep an eye on things for you. Then, you can focus on more important things. Let’s take a look at what’s available and find the best Bluetooth sensors for your use case. If you want to skip the easy stuff and go straight to the Arduino, click below. Many of you aren’t interested in spending your nights and weekends tinkering with your new Bluetooth temperature sensors. So first, we’ll take a look at the commercial solutions with either Android or iOS support. It’s a little pricier at $45 but the performance certainly beats much of the competition. 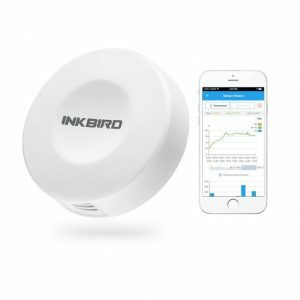 Mobile support: iPhone supported (3.5 stars), Android (3.9 stars) User reviews: 2.5/5 The WeatherHawk Bluetooth sensors are rated to be submerged up to 3 meters (IP-67) and will work with anything newer than a iPhone 4S, iPad 2, or Android 4.3+. The sensors have a range of about 10 meters inside. The temperature is accurate to 1 degree and has a resolution of 1 degree. For $25, it only takes one broken freezer to recoup the cost of this little sensor. Sounds like a decent idea, right? BLE Home is another new manufacturer with a nice looking Bluetooth temperature sensor. The good thing about BLE Home’s SensorBug lineup is that it advertises a lot more in functionality. They even have a WiFi bridge coming down the pipe so that you can keep an eye on a remote location. The down side to the SensorBug is that it only has an iOS app. The app runs on iPhone 4s, iPad3s, and iPad minis and newer. There are a handful of decent options that have Bluetooth support that’ll connect with your phone to keep an eye on your meat while you keep an eye on the game or your guests. I’m not going to go through these in detail, because after all, they are a bit outside the home security space. But, I thought you might be interested all the same. Don’t even ask me how that last one is worth $100. It monitors up to 4 probes and comes with 2 in the kit. But for that cost, it needs to make me an incredible cook too. Maybe it helps, but I’m skeptical! The SensorPush Wireless Thermometer/ Hygrometer, at the bare minimum, is installed with a compact sensor HT1 (which means humidity and temperature sensor version 1) and lets you add more sensors later on for more complex applications. The device has an accuracy of ±0.5°F for temperature and ±3% for humidity. SensorPush is 1.57″ x 1.57″ x 0.65” which is small enough to be installed anywhere you want. You can power it up with a CR2427 battery which can last up to 12 months or more depending on the environment temperature. SensorPush can be paired with any smartphone (Apple iOS or Android) as long as your device supports Bluetooth 4.0. The data gathered from the sensors will be automatically pushed into your app for monitoring as long as you are within 325 feet from the sensors. For added flexibility, you can add the G1 Wi-Fi Gateway (sold separately at $99) so you can access your sensor data online even if you’re away from home. The device already comes with a cloud-based storage for your sensor data and there’s no additional payment needed for the service. It’s free! At $50, you can set-up this compact device in your home or any place where constant monitoring of temperature and humidity is important. 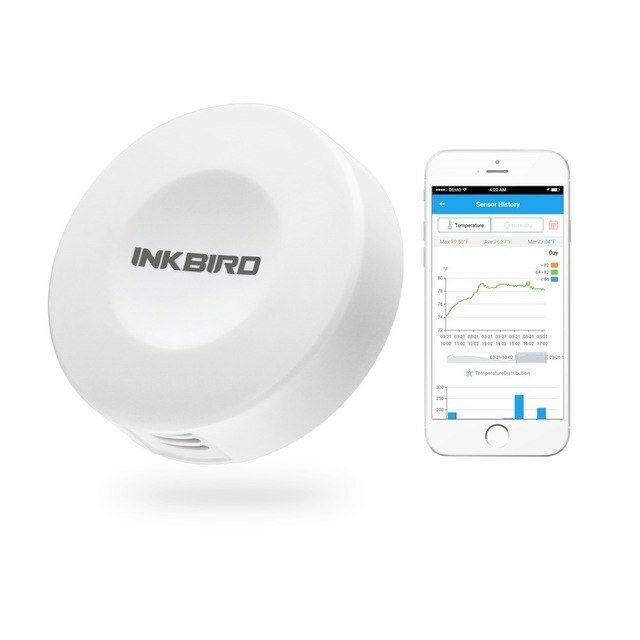 If you’re looking for a cheap and low power device to monitor the conditions of your home and belongings, Inkbird Wireless Mini IBS-TH1 could be your best option. The device comes with an app that supports both Android and Apple iOS that works both on your smartphone and tablet. You can even connect more than one mobile device to monitor your sensors for convenience and flexibility. The humidity and temperature accuracy of the HTU21D sensor is about ±2%RH and 0.5°F, respectively. One nice feature is that you can adjust the sampling interval of the sensors (10s, 30s, 1min, 2min, 5min, 10min, 30min) with a maximum date storage of 30000 point. The device comes with 2 CR2023 batteries and can last for up to 3 months (or more, depending on your chosen sampling interval). At a price of $25.99, it’s already a great deal given its features and functionality in monitoring the conditions of your home, car, cigar, wine, musical instruments and other belongings. Is Bluetooth the best technology for temperature sensors? Maybe you’re wondering, “Is Bluetooth for my temperature sensor really the best technology?”. Then, it might work great for you. On the other hand, if you want to keep an eye on the temperature in a rental house or a second home, then Bluetooth alone just isn’t going to cut it. You’ll need some kind of gateway to put the logged information onto the internet so that you can access it from your phone unless you’re planning on showing up every day . . . kind of defeats the purpose right? If you are trying to monitor temperature at a distance, then a WiFi temperature sensor may make more sense. Something like the wireless tags that I recently reviewed also are good, even though you do still have to pick up a “tag manager” or hub along with the tags to actually record temperatures. They have the added benefit of syncing up (downloading) logged data once you bring them back into range of a hub. If you already have a home automation hub like a Wink or Smartthings (links to our reviews of them), then just go for a door sensor that also reports temperature like the SmartThings multi-sensor. Let’s take a look at the ultimate in flexibility with an Arduino temperature sensor. For those with basic coding skills, this Adafruit tutorial may be the way to go. After pairing the Arduino and company with your computer via Bluetooth, you’ll be able to push new code over Bluetooth with no cables. As far as code goes, the folks over at Adafruit have you covered with a basic sketch to measure temperature and humidity and then print it out. After taking care of the Arduino side, a bit of Python on your PC will read the data from the Arduino and then display it via Tk. You can start with the GitHub repo and then customize for your needs from there. Please share this with your posse! Whether you choose to take the easy route or really tinker with the Arduino, a Bluetooth temperature sensor can really come in handy around the house. That’s especially true for the BLE Home version once the WiFi bridge is released. Then, you could use them to prevent frozen pipes in your mountain home from the comfort of your primary residence! 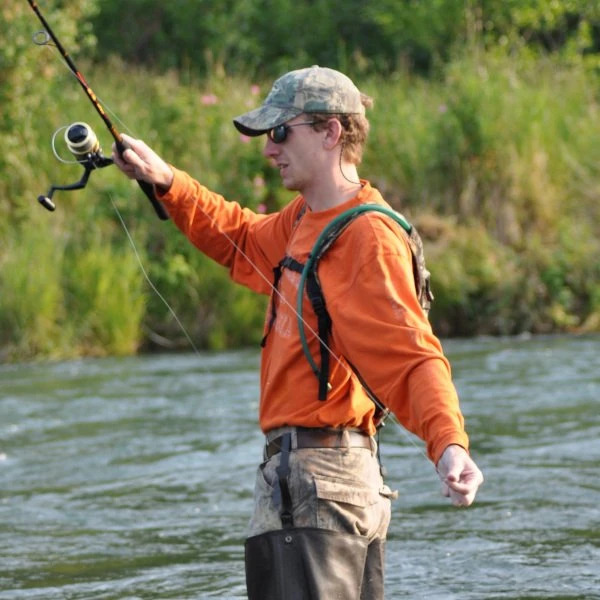 Drop a line in the comments and let me know how you plan on using your sensor. And, don’t forget to share this article with somebody who would like it. I am in need for a specific requirement of this technology fast, Is there a way in which someone could contact me to perhaps guide my purchase a little? Device will be permanantly fixed in a sealed box, made from MDF Fibreglass and Steel bars, and i need to monitor the temperature inside…. 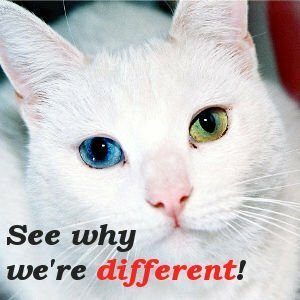 BT might be the way forward…..
You may want to reach out to the manufacturer’s mentioned above as they know their equipment best. I am interested. Fridge, freezer and room temperature monitoring is very important in a laboratory environment. Currently this process is manual and haphazard. I believe there is a market for a plug in solution. I’ve built a working prototype and it’s been running consistently in my refridgerator. Feel free to contact me if you’re interested and can bring this to market. I am looking to monitor the temperature of components of an engine. Where would you suggest I start looking? I would start with cooking thermometers that are designed for grills. They could take the heat, and I would think they would be much cheaper than something actually designed for a car. I want to build in a temperature sensor in the dog kennels in the back of my car. When driving the car, I understand that BLE technology suffices. However, when training the dogs, I’m sometimes away from the car by at most a few hundred meters. What technology do you recommend? In the future, I would like to place a camera in the car as well. All information should be visible in an app on my iPhone. Is there an off the shelf solultion available? A few hundred meters is a big ask even for WiFi chips. I think you’re going to be stuck using a cellular hotspot and a battery powered camera. You could also check out the Arlo Go. It has cellular/battery capabilities.